In autumn 2014, Albrecht Dürer’s monumental Triumphal Arch went on display in the Asahi Shimbun Display in Room 3 to great success. 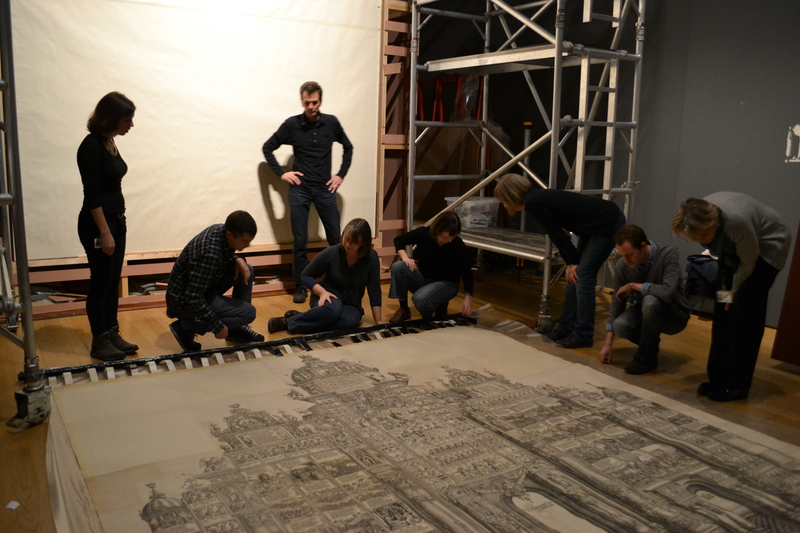 In this blog, Joanna Kosek, discusses the delicate operation of dismantling such an exhibition. The display of Albrecht Dürer’s (1471–1528) monumental Triumphal Arch in the Asahi Shimbun Display in Room 3 in autumn 2014 was a great success. The enormous print, produced at the height of Dürer’s career to glorify the reign of the Holy Roman Emperor Maximilian I (r. 1486–1519), appeared appropriately majestic in the softly lit room and attracted over 70,000 visitors in three months. Originally designed to be pasted on the walls of princely castles, the impression at the British Museum was never used as originally intended, and is one of only a handful to have survived. In the Museum the print, which measures four metres by three metres, had been lined onto a textile backing and had long been displayed in a massive frame by the Gallery Café. After the Room 3 show it was time to take the print down to inspect, conserve and store it in darkness to help preserve it. Dismantling the exhibition started with detaching the glazing which consisted of three four-metre-high pieces of laminated glass that had been painstakingly installed back in September by expert glass handlers. Now we watched the delicate operation of lifting the heavy glass in the reverse order of installation and, yet again, held our breath when giant suckers manoeuvred the heavy green-tinted glass panes, one by one, to expose the beautiful cream-coloured early 16th-century paper. Detaching the glazing from the print. In the meantime, in preparation for taking the print down, we had constructed a huge half-metre-diameter tube in the Museum’s state-of-the-art Paper Conservation Studio. This ‘quicker-by-tube’ production needed to be sturdy but light. As nothing like this was commercially available, the team of conservation mounters made their own using transparent plastic sheeting filled in with foam padding and cardboard rings to prevent collapse, which could damage the print. There was a lot of laughter as two of the team plunged inside the roll to fix the padding! No effort was spared to make the roll perfect for the job. The specially made tube being carried to Room 3 via the Great Court. The day of the great descent arrived on 17 November. 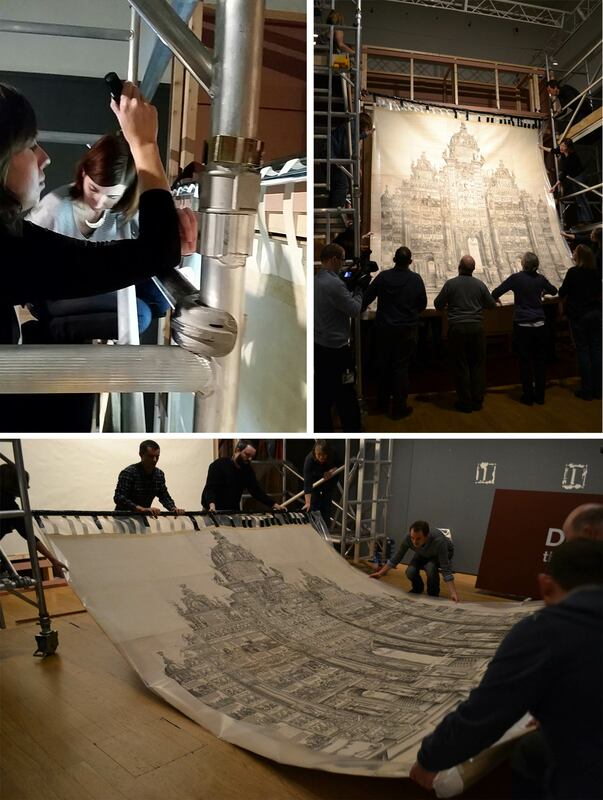 Equipped with two scaffolding towers and supported by heavy object handlers and curators, and filmed by the Museum’s Broadcast team, we first attached the top edge of the vast print to a four-metre-long rod using heavy linen tape. Attaching top edge of the print to a rod and taking the print down. Inspecting and rolling the print up for transport. 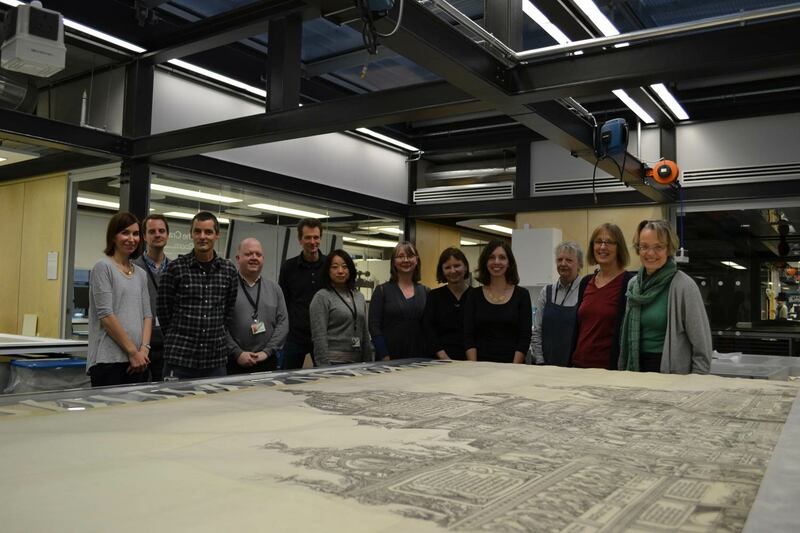 With so many helpful hands to roll it safely, in no time the print was taken onto its grand ascent to our Paper Conservation Studio in the World Conservation and Exhibitions Centre. 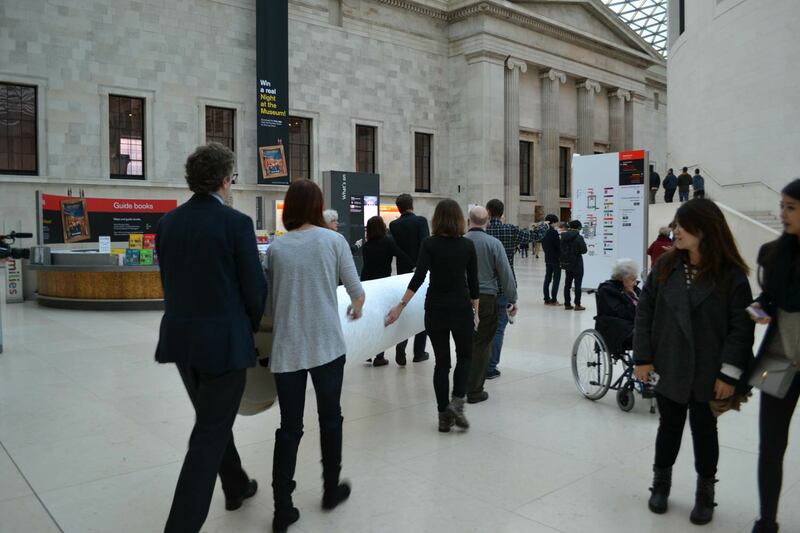 As we had already rehearsed the route carrying the empty roll, we had no surprises, although that did not apply to crowds of bewildered visitors. 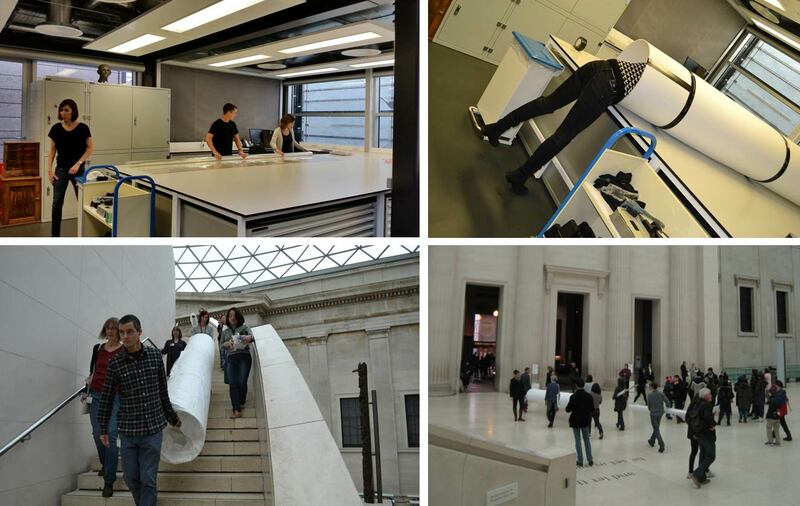 The print being taken through the Great Court to the World Conservation and Exhibitions Centre. At last the arch was unrolled on the large tables in the Studio and while admiring it and planning what should come next we posed for picture as a memento. The print laid out in the WCEC Paper Conservation Studio.